Rocky Springs was, for many years during the later part of the eighteen century and most of the nineteenth century, a thriving community on the Old Natchez Trace. Initially little more than a watering place, the area was first settled around 1790, with Mayburn COOPER settling there in 1796 and recorded in the 1816 census as landowner and head of a family. It was at Rocky Springs that Isaac POWERS built his famous tavern. During these early days, travel on the Trace was by no means safe and it is interesting to note that it was near Rocky Springs that the infamous John MASON once lived. 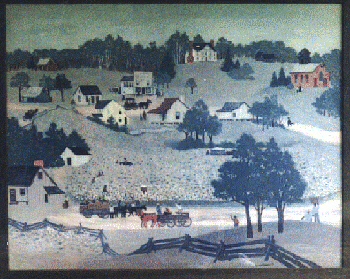 The settlement grew and the 1829 election precinct received 90 votes. Isaac POWERS was postmaster, and the great mails from the north and south met at his tavern, 18 miles north of Port Gibson, 3 times a week. As early as 1837 there were a number of residents, several stores including ones owned by Garrett KEIRN and a Mr. DREXLER, and a church. The first private school, the Rocky Springs Academy, opened on the 1st of January, 1838, under the direction of Mr. HOLMES. The area reached a maximum population of about 2,600, plus slaves. In 1860 the population was 2,216, plus about 2,000 slaves, all living within a 25 square mile area. This safe (left) and cistern (right) are two of the few items remaining in the now-extinct town of Rocky Springs. burdensome taxes, the town's inaccessibility, and almost 100 years of poor farm management causing erosion of the soft soil, created the demise of Rocky Springs. One by one, the citizens began to move away. Finally, in the 1930's, the last store closed. Even the natural springs, for which the town was named, began to dry up. 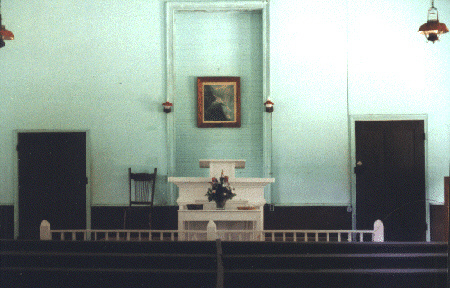 Sanctuary of the Old Methodist Church. The brick structure was built in 1837. It is situated on a hill overlooking the town. Services are still held every Sunday. Today only a few artificats remain of the town of Rocky Springs. However, the old Methodist Church whose first pastor was Rev. Thomas OWENS, is situated on a hill overlooking the once thriving community, still holds regular Sunday services. The church remains as it was in 1837, except that in 1901, the old belfry was removed as it was considered dangerous. Early Christian workers of this church were the families of HARDINGs, LUMs, McCLELLANs, POWERS, BROWNs, BROCKs, CLARKEs, WALLACEs, FAULKs, McCAYs, POWELLs, and McLEONs. 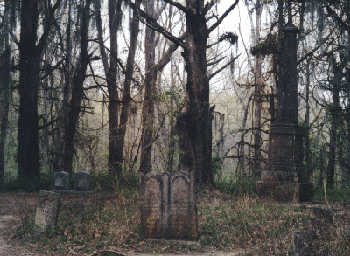 The Rocky Springs Cemetery is located behind the Old Methodist Church. Burials pre-date the church, which was built in 1837. Today, Rocky Springs can be accessed via the exit at mile marker 54.8, on the Natchez Trace. Copyright © 2005—Present by MSGenWeb. All rights reserved. Copyright of submitted items belongs to those responsible for their authorship or creation unless otherwise assigned.